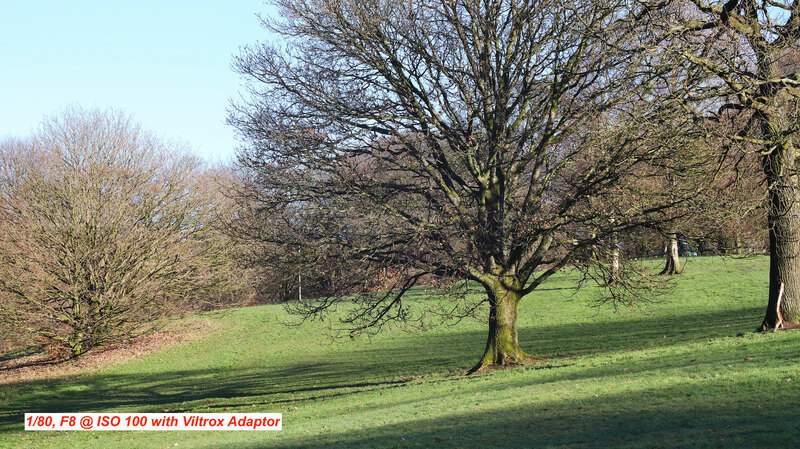 The Viltrox EF EOS M2 is the latest focal length reducer for Canon mirrorless EOS M series cameras. 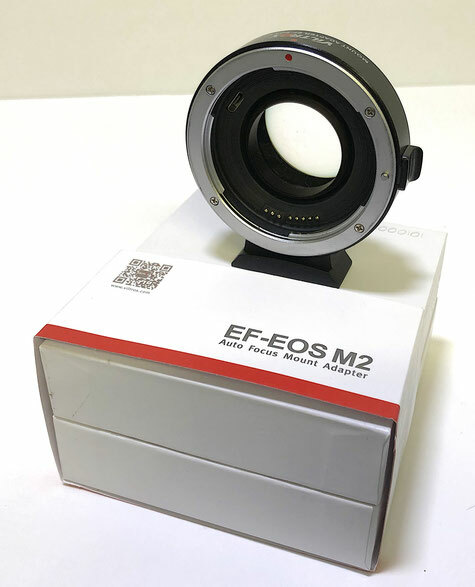 It allows Full frame Canon EF (only EF lenses) to be used with the EOS M with the advantage that it makes the full frame lens focal length almost the same on the APS-C crop factor EOS M series of cameras. The actual new focal length multiplier instead of being 1.6 as for the APS-C sensor but it is now 1.6 x 0.71 = 1.14. So for example a 50mm FF lens which would normally be 80mm on the EOS M using the EF to EOS M adaptor will now become a 57mm lens. 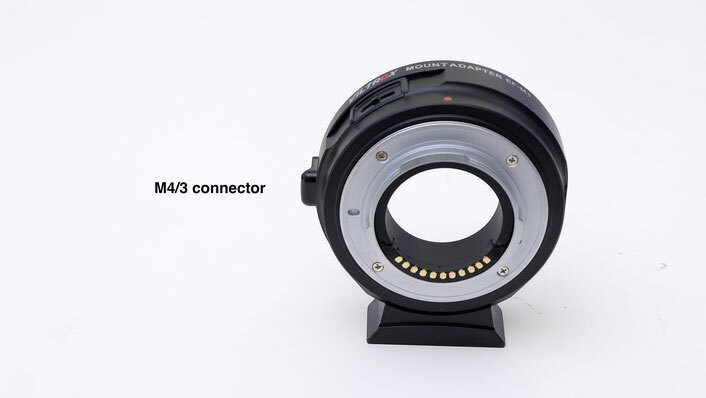 Also because of the reduction in the image circle to fit the APS-C sized sensor the actual light intensity on the sensor is increased giving an effective 1 f-stop speed gain - hence the trade name of " Speed Booster" marketed by Metabones. 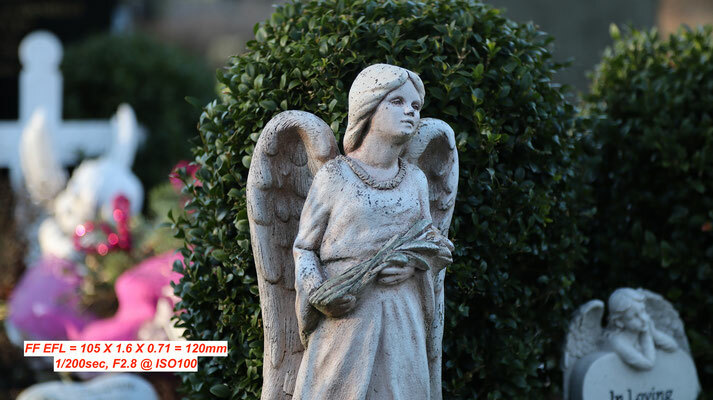 Change the focal length and you change the ray directions and the spatial variation of intensity (illuminance). This is the Viltrox EOS M2 unboxed. It is supplied with a plastic moulded case and front and rear caps along with an allen wrench to remove the Arca style tripod mounting foot. 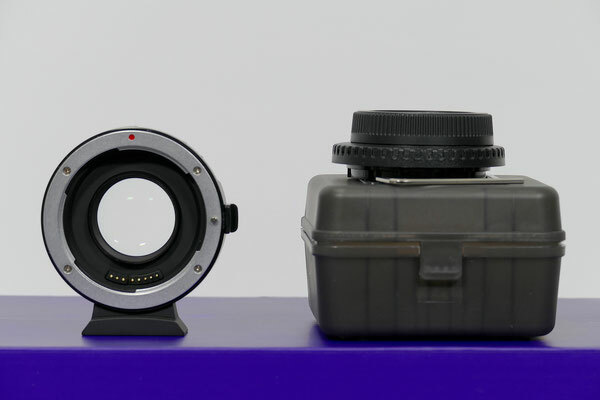 So how is it that these devices can reduce the focal length of the Full Frame lens that is attached to it. In the illustration above, I set up as light source in front of a convex lens which had a long focal length. You can see the slightly converging beam from the lens. 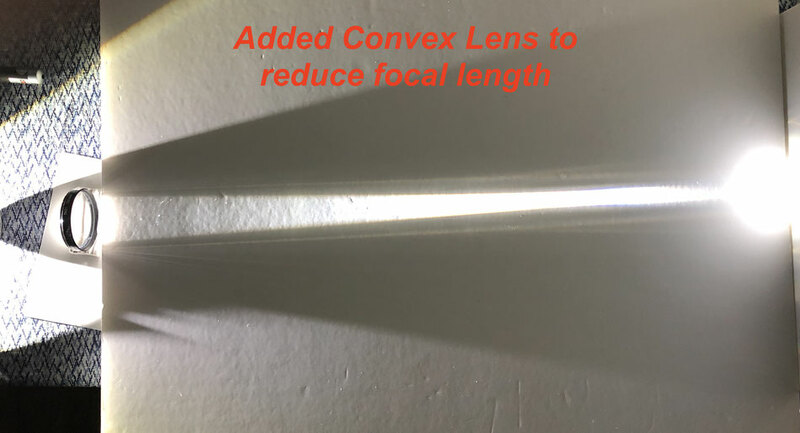 Now by adding a second convex lens (as the compound lens of the Vitrox is essentially a convex lens) you can see how this causes the beam to converge. 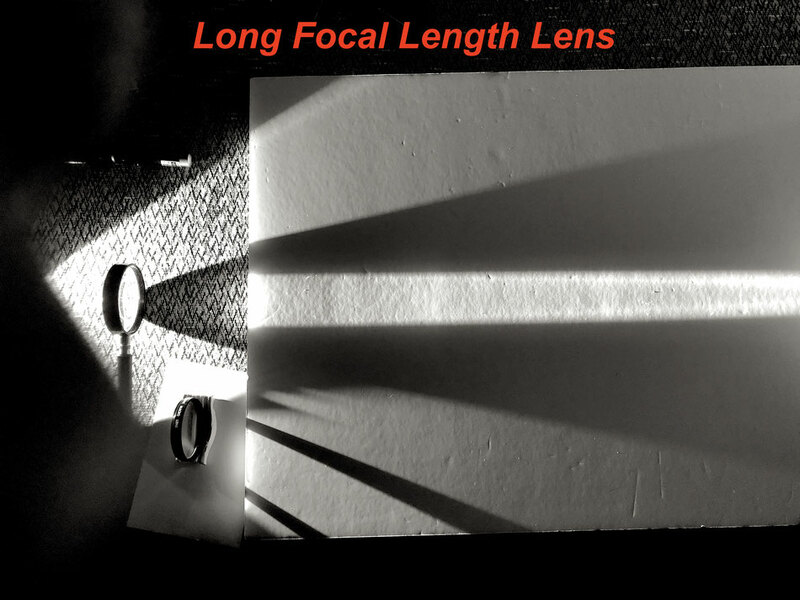 This is the effect of reducing the focal length of the lens. The imaging circle is smaller and brighter - again confirming the Viltrox speed gain. From my video review on Youtube the final developed raytrace showing how the addition of the second convex lens if placed beyond the focal point of the camera lens will shorten the focal length of that lens. 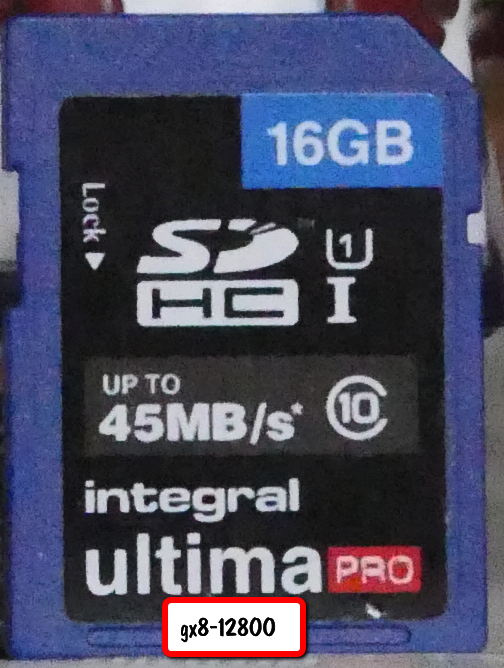 By experimentation I found that the Viltrox has a focal length of 70mm. Construction wise all of the Viltrox adaptors are all metal and have a good finish with good attention to internal light baffles etc. The internal surfaces are not "flocked" but I haven't noticed any reflections or ghosts that you wouldn't normally expect to see. 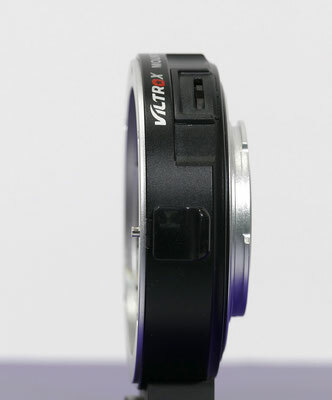 Body and lens flange are nice and tight with very little radial "play" when twisted. The tripod mounting foot has a profile which would fit a standard "Arca" style QR base and can be removed if needed with the supplies Allen wrench key. 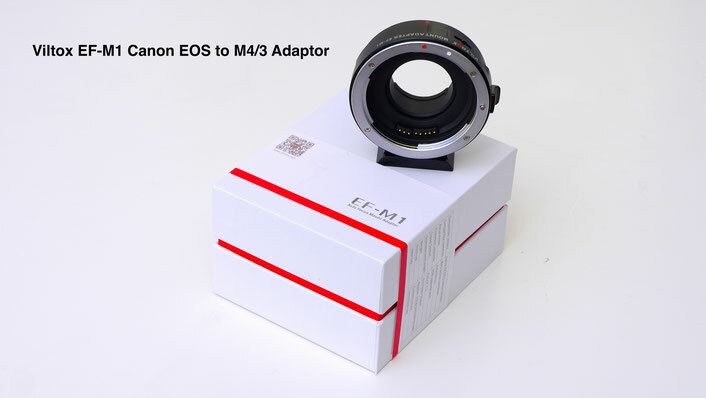 Whilst the adaptor lets you use your existing EF lenses on the EOS M series cameras and recover some of the image as the effective magnification become just x1.14 instead of the usual x1.6 the gain in doing so is to get the extra benefit from fast aperture lenses and the 1 f-stop light gain. This also impacts on 4K video as the image circle is reduced and its intensity increased so better image quality as a result - especially in lower light. To verify the accuracy of the claimed reduction in focal length of 0.71 I set up an experiment to measure the field of view. 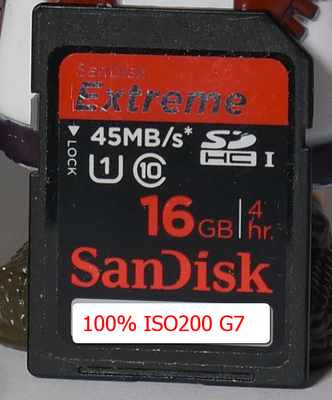 I used my 100mm F2.8 macro lens with the Viltrox EOS M2 to establish the width of the image at full sensor pixel width (4:3) giving the 6000x4000 pixels. 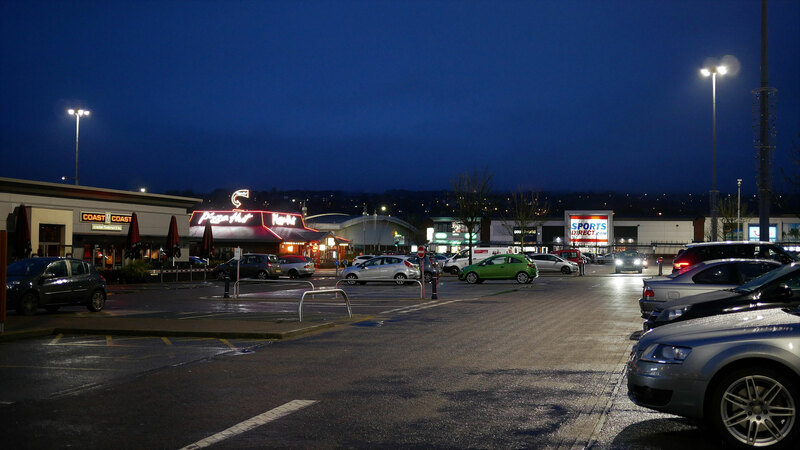 You can see that the width of the image is 93mm and the distance to the sensor was 470mm. Using a bit of trigonometry to work out the tangent of the midpoint 46.5mm as the opposite of the right angle triangle and 470mm as the adjacent returns an angle of 5.65 degrees so the real field of view is 2x this or 11.30 degrees. So pretty close enough to call accurate! 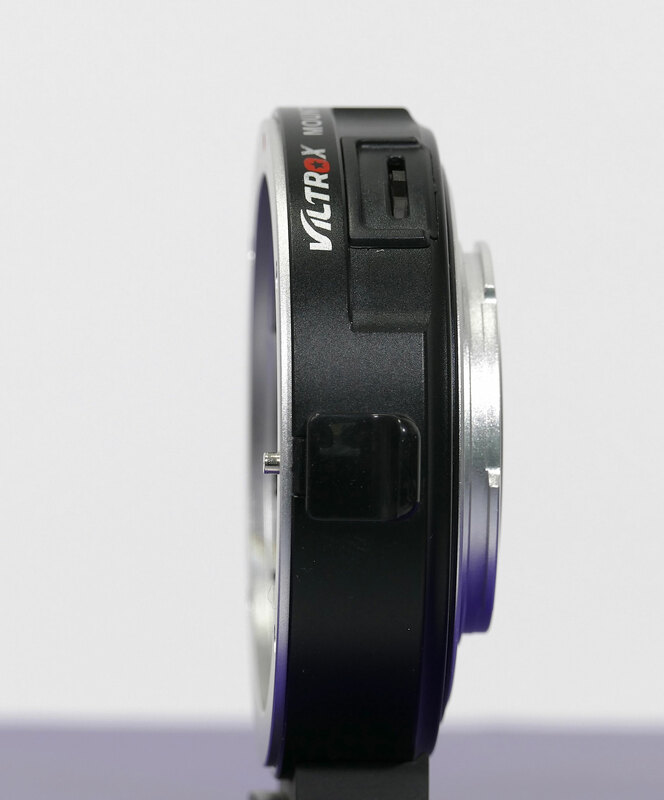 The VILTROX EF-M2 is an "active" adaptor allowing the use of Canon EOS EF(only) lenses on a micro four thirds system. 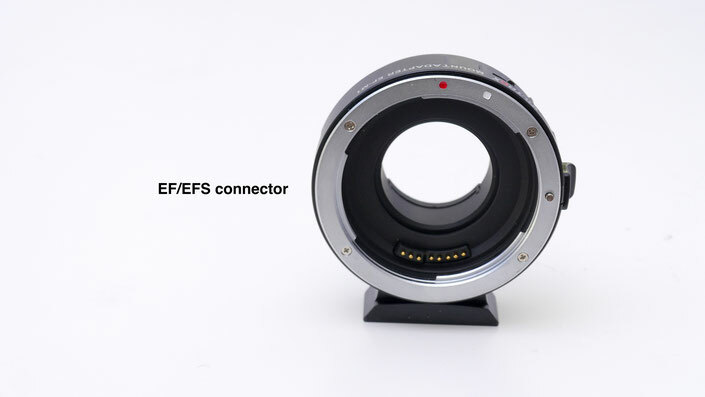 It allows the control of Aperture, Focus and image stabilisation for any lens which supports that function and gives the advantages of reducing the 2x crop factor to 1.4x and giving an increase of 1 f-stop in light. Looking exactly like the M1 version the only difference is the addition of the lens elements to provide the focal length reduction. The limitation is that only EF lenses can be used as the lens rear element on most EFS lenses would hit the front element of the Viltrox M2 optics. 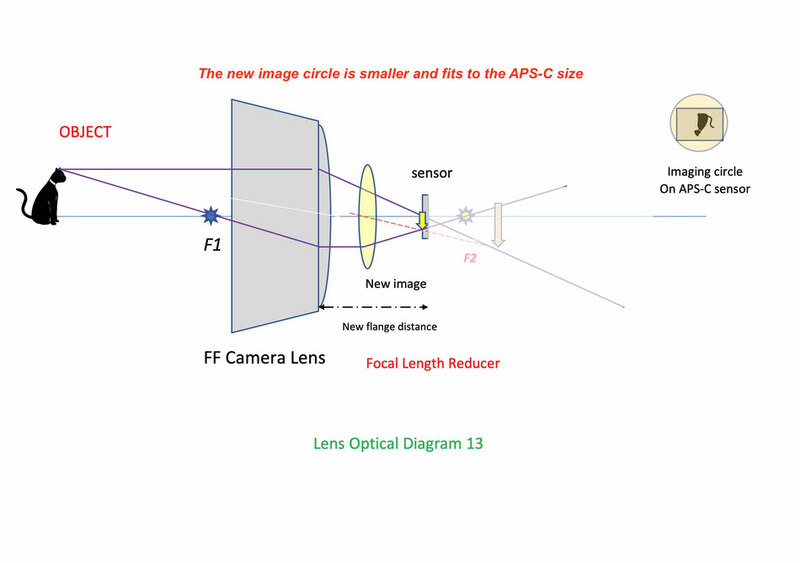 If we consider the f-number of the converted lens, the aperture diameter is unchanged, but the focal length is shorter, so overall the f-number has become smaller – that is, the lens has become ‘faster’. In reality, the lens is still transmitting the same amount of light, but it has just been packed into a smaller area by the extra power of the lens – which is why the ‘speed booster’ only works well if the sensor of the camera it is used with is smaller than that of the camera for which the lens was designed. Build quality is quite high with chromed front and rear flanges. Lens release is firm and works well. Software updates to the firmware are achieved by plugging the M2 into a PC with a micro USB cable and copying the .vtx file from the download folder to the new USB drive. Updating takes just second. Attractively Packaged and supplied with Allen key wrench to remove/fit the tripod mount foot if necessary. 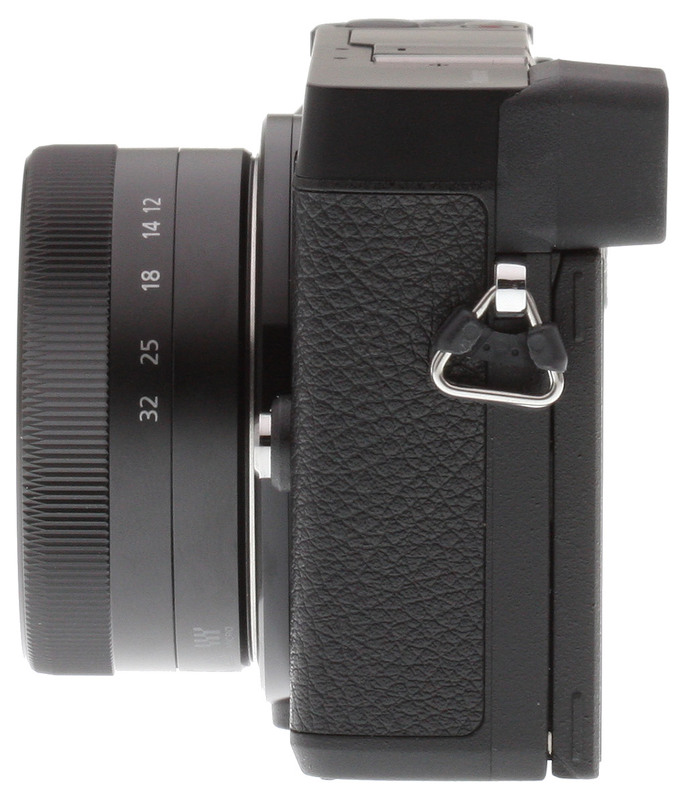 The rear of the unit features the micro four thirds mount, metal mount on metal body. 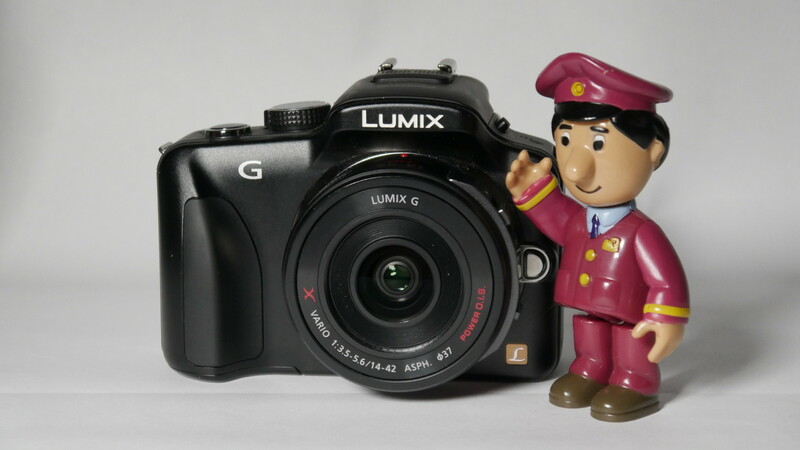 Tested with Panasonic GX85, GX8, GH3, G9 and Olympus OMD EM1-Mk2. 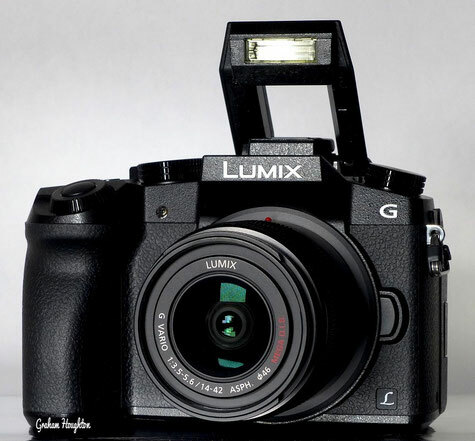 The GX80 is a micro four thirds camera from Panasonic and is a mid range model. 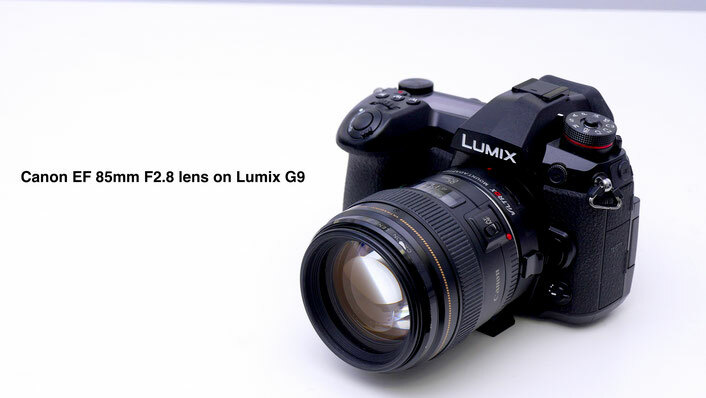 It sits beneath the GX8 but above the G7 in terms of functionality. 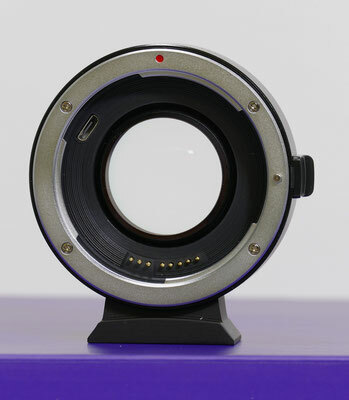 The new feature of this camera is that the anti-alias filter (optical low pass filter) has been removed from the sensor. It appears to be the same 16M sensor as the G7. This is said to improve the sharpness of images captured such that it rivals the GX8 which has a 20M sensor. It features a flip/tilt LCD tilting up by about 90 degree and down by 45 degrees for those overhead shots. this screen is also touch enabled which offers lots of useful features if you are a fan of this operation. From moving/sizing the focus point, navigating menus changing on screen tool position like the histogram pull focus etc.etc. It also supports 5 soft function keys on a "fly-out" panel from the right of the LCD. These allow user programmed features or in video mode allow control of aperture, shutter speed, microphone level etc. All the external ports for the camera (HDMI and USB) are now on the right hand grip side of the camera. Interestingly the USB port is now used for in camera charging but you cannot power the camera from the USB port for extended shooting or video capture. It supports 4k video/photo shooting but alas does not have a microphone input port nor does it support the Cinelike D and V profiles of the professional grade cameras. 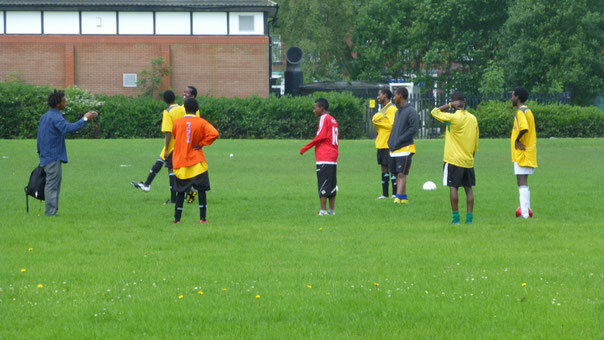 You have to use the Natural photo style and customise the settings to your liking for post processing. The new in body stabilisation - dual IS now adds to the 4 axis mode of the GX8 giving now 5 axis (up/down, left/right and now rotational) stabilisation which is active even during video recording in 4K.As for ISO sensitivity, the Panasonic GX80 is rather straightforward. As with other recent Panasonic cameras, the GX80 features a native ISO range of 200 to 25,600, with an extended low ISO of 100. Not surprisingly, the GX80 offers both RAW and JPEG image capture, plus with its new on-board RAW development feature, you have the flexibility to shoot all in RAW and then easily process your shots into JPEGs after the fact, making use of the GX80's array of creative options, all in-camera. The GX80 also includes Panasonic's Starlight AF mode, which can detect the precise, small contrast differences in stars compared to the night sky for easy focusing. The Panasonic GX85 offers a similar array of other autofocus features found in recent Lumix cameras including focus peaking, Pinpoint AF, and Full Area AF, letting you focus on anything within the field of view. 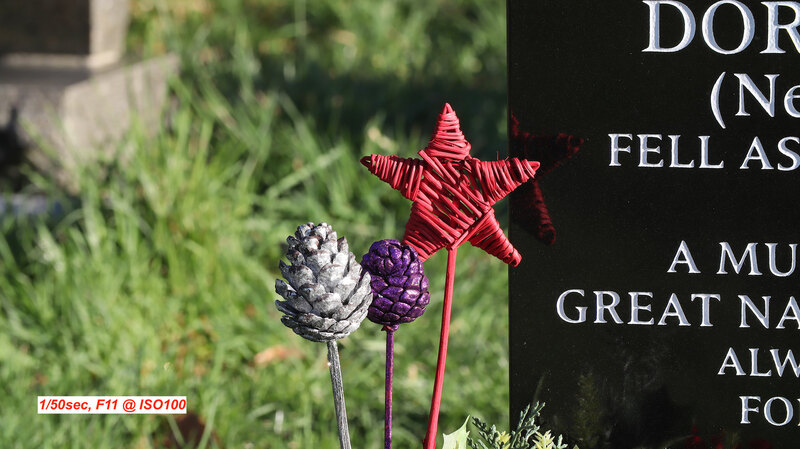 The GX80 also includes the 49-Area/Custom Multi mode, which lets you freely select a custom group of AF areas as you see fit for the particular subject. The camera also has Face/Eye Detection AF that automatically detects the face and left or right eye of your subject. For capturing fast action, the GX80 is capable of 8 frames per second with focus locked at the first frame. If you want continuous focusing, the burst rate drops slightly to a still-respectable 6fps, which is in-line with the earlier Panasonic GX8's performance specs. As with the GX8, this camera also lets you opt for an all-electronic shutter mode, which bumps the AF-S burst rate up to a handy 10fps. There's also a Super High-speed burst mode at a whopping 40 frames per second, though it only captures JPEGs at a much lower 4-megapixel resolution. The Panasonic GX80 offers loads of exciting features surrounding its 4K capabilities, particularly with regard to 4K Photo modes. Starting with the video features, the Panasonic GX80 is capable of capturing 4K UHD (3840 x 2160) video at both 30p and 24p, as well as a variety of Full HD and HD frame rates. The GX80 captures video in either MP4 or AVCHD formats, however 4K is only available in MP4 mode. 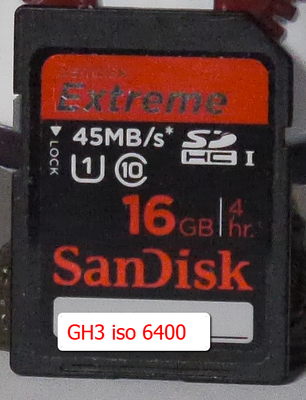 Though not as robust a selection of formats and bitrates as the video heavy-hitter GH4, the GX80 still offers 4K video at a high quality 100Mbps bitrate. Bitrates for Full HD and HD videos aren't nearly as high. For MP4, 1080/60p is captured at 28Mbps, 1080/30p at 20Mbps, and 720/30p at just 10Mbps. For AVCHD videos, 1080/60 is pegged at 28Mbps, and both 30p and 24p options top-out at 24Mbps. Continuous sustained 4K video recording is unlimited for the NTSC-region model. Pal models stop recording at 29mins 59sec. 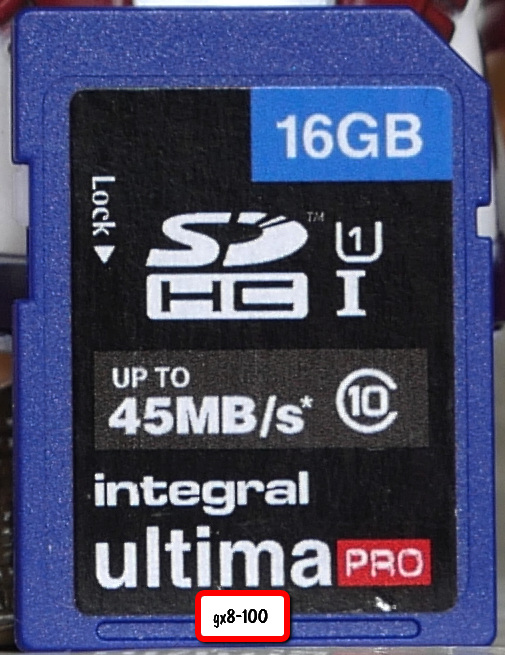 The camera will continuously record videos until the file size reaches 4GB, at which point a new file will automatically be created, although playback will be seamless. One new video trick that the GX80 offers is a new 4K Live Cropping feature. The camera is able to utilize the entire sensor area, but only capture a smaller 4K-sized frame within that area. What this allows is an all-digital, programmable and automated panning and zooming feature while recording video -- You can set start and end points for panning, or the end zoom framing, and the camera will smooth and automatically capture 4K video with these pre-programmed "movements." These LED light panels come in a range of sizes and output power rating. There are basically two types the "A" type having all daylight rated LEDs and the "B" type which is a bi-colour LED populated unit with half the matrix being daylight LEDs and the other half tungsten rated LEDs. Above are the model LE-520A and the LE-720A units. The 520A is populated with a 22x 24 LED matrix and the 720A is populated with a 24 x 30 LED matrix. The rated light output from the 520A is 3400 lumens and from the 720A 4700 lumens, however I measured the lights at exactly 1 metre distance and found the outputs to be more like 2500 lumens for the 520A and 3400lumens for the 720A using the soft diffuser and an battery power. In both cases the LED colour temperature measured was about 4900K. All this series of lights features barn doors however due to the nature of the panels and the wide beam angle I found them to have very little affect on the output. It is not possible to shape the light as you can with a spot light type light unit. These lights are fitted with a 2.4 GHz Wi-Fi controller which is used to control the light intensity. It provides the facility to select the light on 1 of 4 channels (H1 to H4). By selecting the correct series (A or B) on the controller it is possible to change the light output level in the case of the A series units or on the B series units you can select the LED bank used for the output - either of the Daylight LEDs or the Tungsten LEDs or have both on simultaneously. All the lights come with a soft diffuser and a CTO (colour temperature orange) diffuser. This can be used to provide an accurate 3200K output but at the expense of about 2 F-stops light loss. Power is provided to the LED banks using pulse width modulation which keeps the voltage the same but varies the ratio of on to off time of the applied voltage. 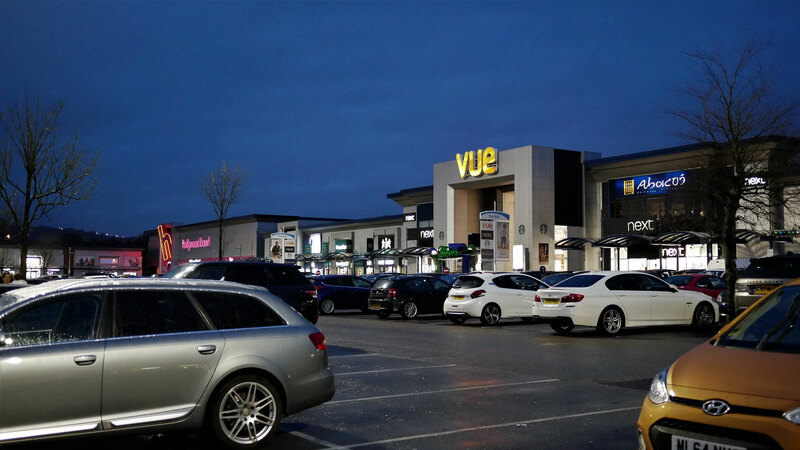 This keeps the colour temperature constant rather than dimming the LEDs through voltage reduction which can lead to colour temperature changes. The power level is displayed on the rear of the unit on a two digit LED display and can be adjusted in unit increments from 0 to 99. in the case of the "B" series lights both the 3200K and 5500K LEDs can be adjusted independently. The unit has an inbuilt fan which in the auto mode powers up to cool the unit if it begins to overheat. 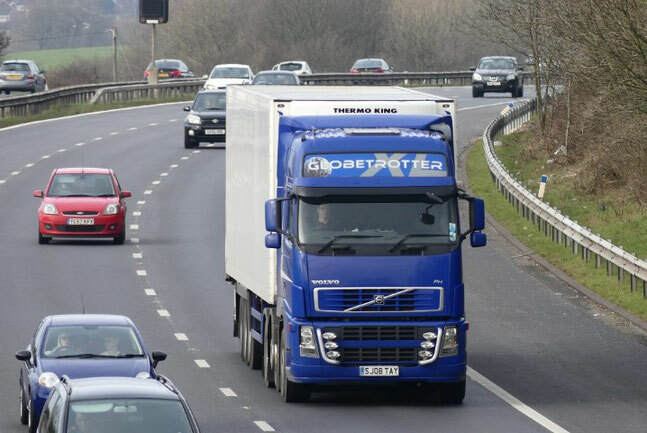 The fan noise is noticeable at close distances when running at full speed however, it is unlikely to be picked up at the light placement distance from the subject. The unit, being wireless controllable can be assigned to 1 of 4 available channels so 4 lights could be set up and controlled with the one remote control unit. This unit also has a strobe effect lighting mode. The frequency of which can be controlled from 1 - 10 flashes per second in unit increments and then units of 10 from 10 to 90 flashes per minute. Power can be adjusted as normal for this mode. In summary they are useful light sources able to be used to provide a fill light for either tungsten (3200K) or daylight (5500k) lighting situations and made easy to adjust by the wireless remote controller. 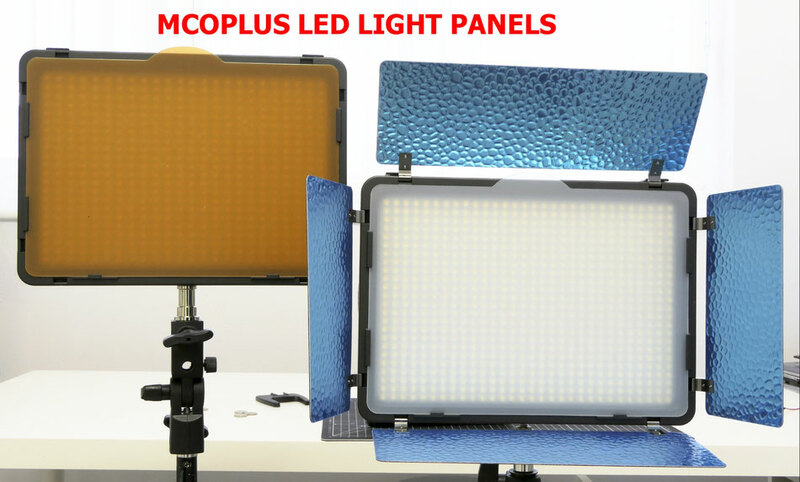 They may also be used to provide illumination for head and shoulder type interviews however as with all these smaller panels does not give enough illumination for head to toe shots without significantly increasing camera ISO. 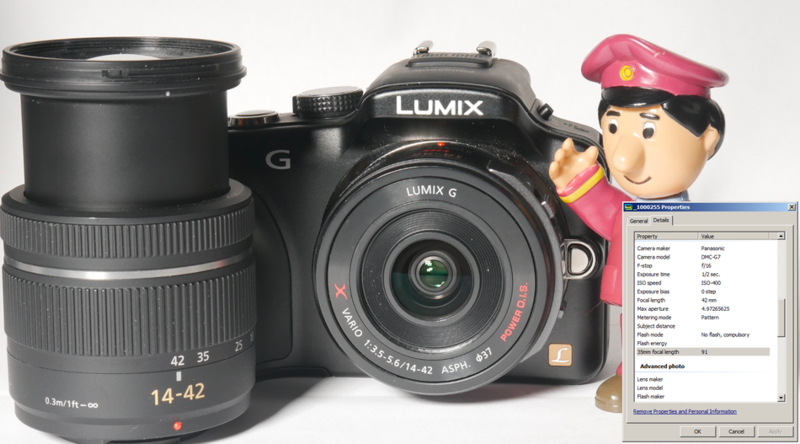 Replacing the Panasonic G6, the G7 sits beneath the Panasonic GH4 in the Panasonic's line-up of compact system cameras. 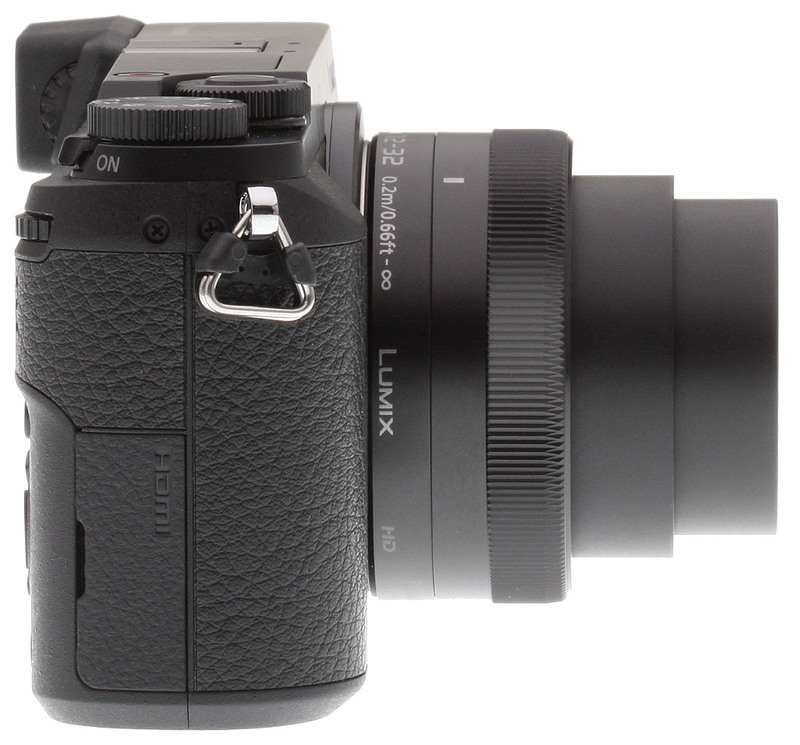 It's the smaller of the two SLR-like models, and is aimed at enthusiast photographers. 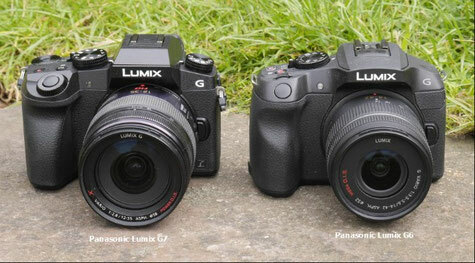 It sits alongside the Panasonic GX7, and above the GF7, GM1 and GM5. 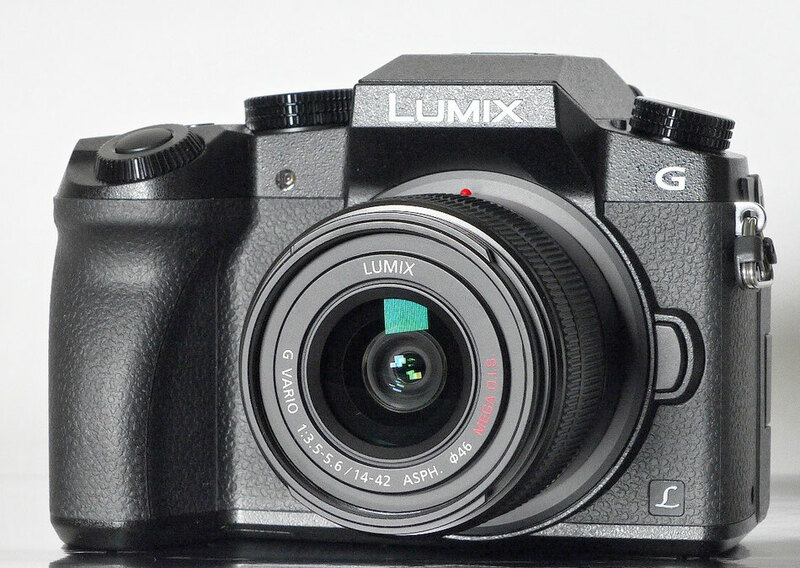 On the face of it there doesn't appear to be much on offer to those who may already own the Panasonic Lumix G6 camera which does a superb job of crafting both stills and video. 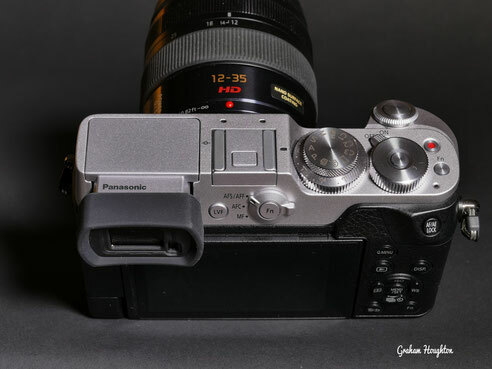 However when you dig a little deeper you will see that Panasonic have actually added a lot of new features to this camera and makes it an exciting model to look at if you are wanting to step up to a micro four thirds system camera. In this image you can see the more angular design of the G7 compared to the more rounded style of the G6. The addition of the two control dials and the shooting mode dial on the G7 should be very obvious additions. On the rear of the camera the welcome removal of the dual function "click in and rotate" back control wheel which became the Achilles heel of the FZ200. 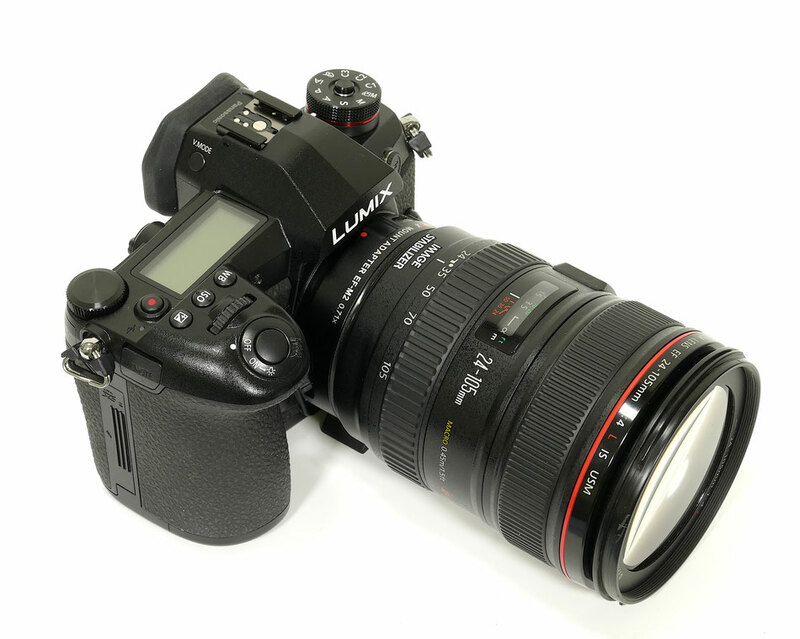 Now replaced by two control dials, one under the forefinger and the other under the thumb give fast access to aperture and shutter speed when in the manual exposure mode. The camera also has no less than 10 programmable Fn (function buttons) 5 physical and 5 on screen ones. Each button can be assigned from 14 pages of 4 options! The G7 electronic viewfinder is one of the highlights of the camera. It's large, bright, detailed and can display a wealth of information and shooting aids including effect previews, a live histogram, magnified focus assistance, levelling gauge, focus peaking, zebra patterns and a variety of alignment guides. It's an OLED panel, with a magnification of 0.7x, the resolution has been upgraded from 1440k dot (800x600) to 2360k dot (1024x768) in this model. The LCD is touch enabled for either point to focus or point to shoot. 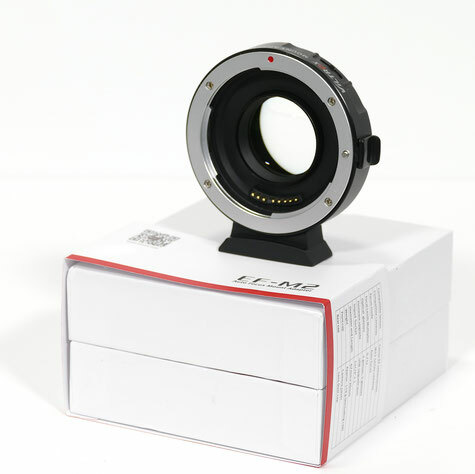 It can be used as point to focus if used in conjunction with the EVF. I did find my nose often touched the panel causing my focus point to shift from where I intended it to be. 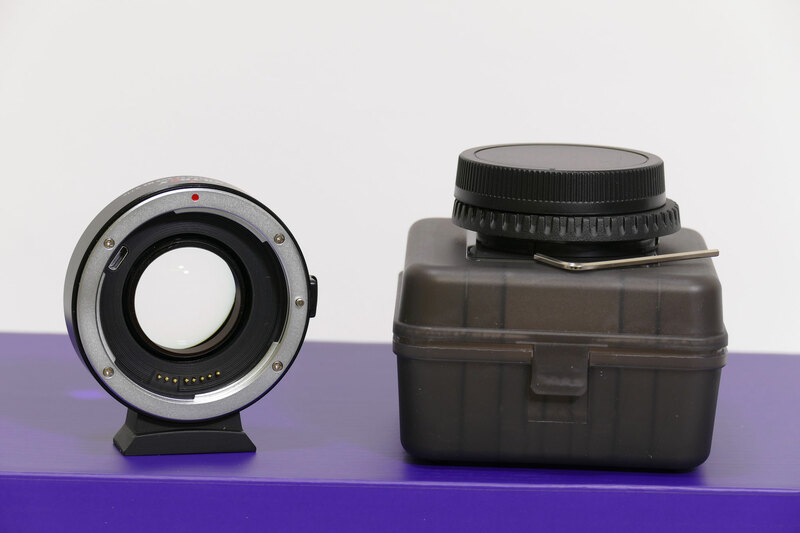 The new kit lenses are more compact than previous models and in particular the 14-42 doesn't extend as far as the previous model thus making the camera a lot more compact. Image quality appears to be improved as well. Native base ISO for the camera is ISO 200 with the option to extend to ISO 100. 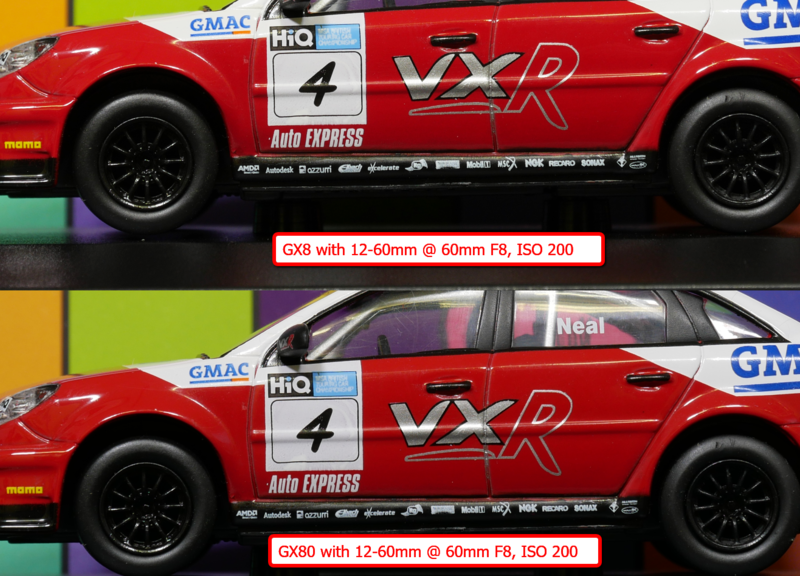 If you do select ISO 100 the loss of highlight is very apparent so that's why I guess its buried in the "extended" range! One new feature on this camera is the setting to combat "diffraction limited resolution". 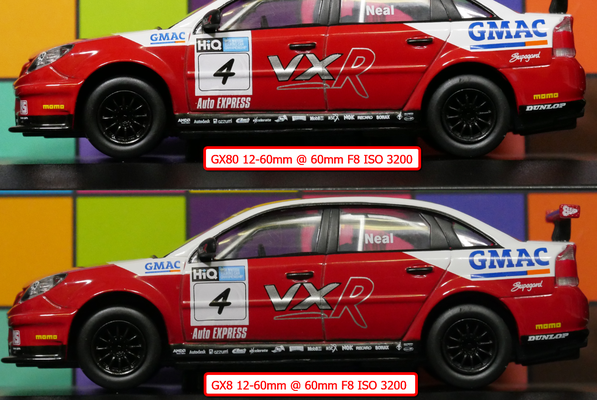 Normally with micro four thirds cameras using apertures smaller than F11 results in a slight softening of the image. 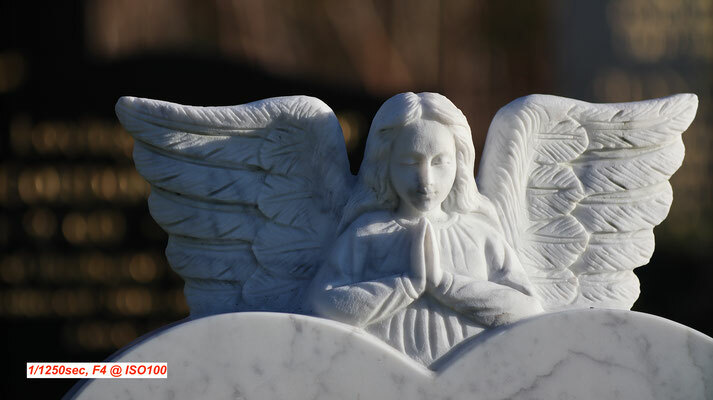 When this option is turned on it is still very acceptable image sharpness at F16 allowing more depth of field which is particularly beneficial for macro photography. One of the reasons to purchase the G7 is the ability to shoot 4K UHD video at 30fps or shoot 4K photos in 1 second bursts at 8 Megapixels or extract a single frame from the UHD video clip. 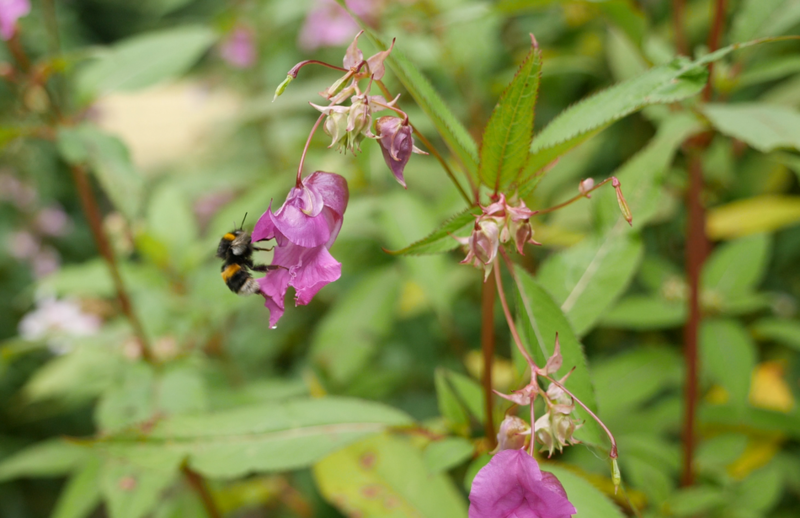 Here's a sample from a 4K video clip where I was able to capture the exact moment this bee fell out of the flower to fly to the next one! 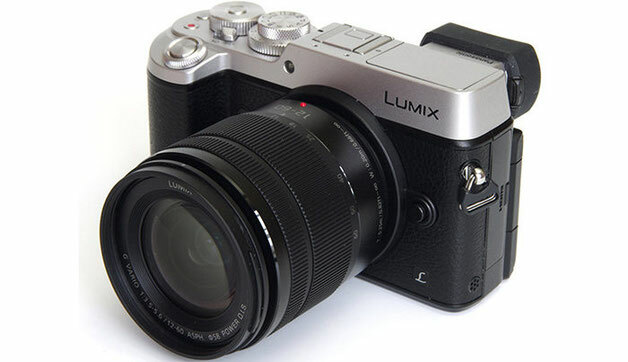 The Panasonic Lumix GX8 is a camera aimed at enthusiasts and complies with the Micro Four Thirds standard. It replaces the Lumix GX7 which was the first Lumix body to feature built-in stabilization. The new GX8 shares the flat-topped styling as the GX7, but is all-round bigger than the GX7 however it now boasts weather-sealing. Like the GX7, there's an electronic viewfinder in a housing that can tilt up by 90 degrees, and now consists of a 4:3 aspect ratio 2,360,000-dot OLED instead of the traditional LCD, the image is now larger too. It supports a 3in touchscreen, but again the LCD panel of the GX7 has been switched for a 1,040,000 dot OLED. The screen is now fully-articulated rather than just tilting vertically. Previous cameras employed 16 Megapixel sensors, the GX8 has now 20 Megapixels, making it the highest native resolution Micro Four Thirds body to date. 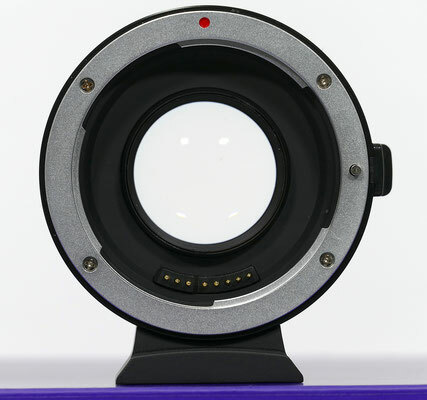 The sensor has four axes of compensation and the ability to work with OIS lenses (with firmware updates) to add additional two axis stabilisation to further improve performance. The GX8 also offers 4K video (lens stabilised only), fast contrast AF with DFD technology (Depth-from-Defocus), the choice of mechanical or silent electronic shutters (with a maximum speed of 1/8000 or 1/16000 respectively), and 8fps burst shooting or 6fps with continuous AF. Previously on the GX7, optical stabilisation took priority, so if a lens supported it, the in body stabilisation was disabled. If a lens without OIS was mounted, then the in body system turned on, operating in two axes. 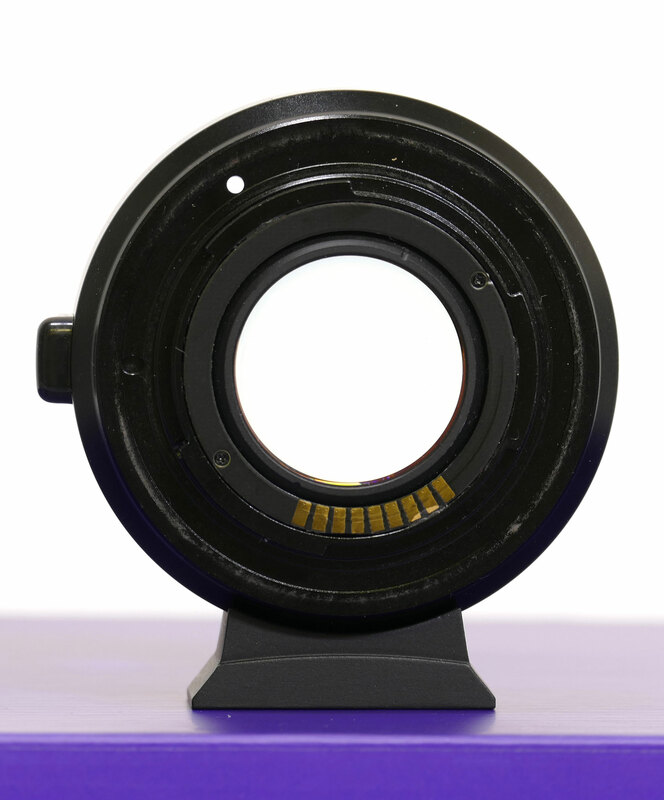 This was great for legacy lenses on micro four thirds adaptors. On the GX8, the in body stabilisation now operates in four axes, but additionally it also works alongside any existing lens-based OIS. This so-called Dual IS system combines the efforts of OIS and in body stabilisation, but requires that the lens knows about it first with a firmware update. 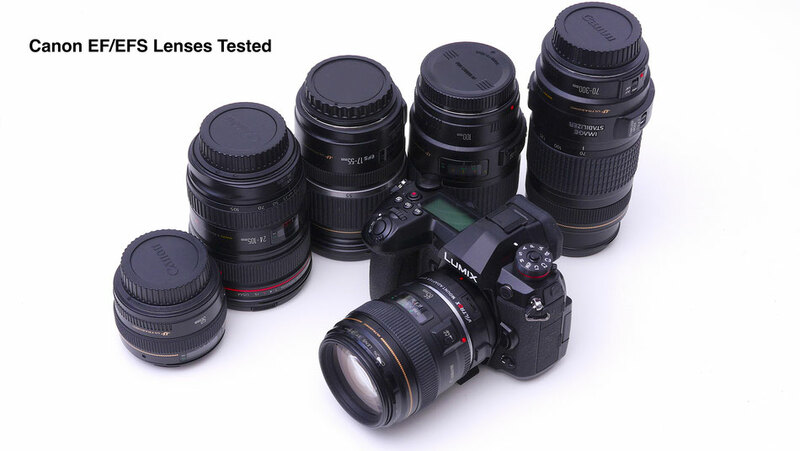 The latest lenses, such as the 14-42mm and 14-140mm kit zooms, as with the 12-35mm f2.8, 35-100mm f2.8, 30mm f2.8 Macro and 42.5mm f1.7 all have firmware updates to support Dual IS with more to follow. In video mode, the GX7 didn't offer any in body stabilisation, instead relying on lens OIS where present to suppress any wobbles. The new GX8 still doesn't offer in body stabilisation for video, but it does at least now offer electronic stabilisation for video which can work alongside any lenses with OIS. However this feature is only available when filming in 1080p; if you shoot in 4k, there's no stabilisation unless you're using an optically-stabilised lens! 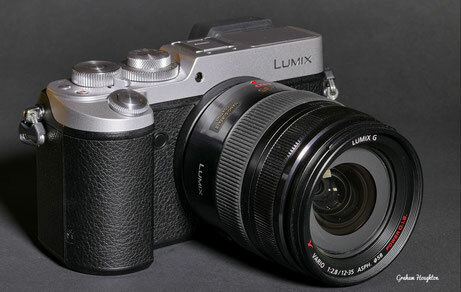 Panasonic now allow you to switch the function of the twin dial on the top plate of the camera. 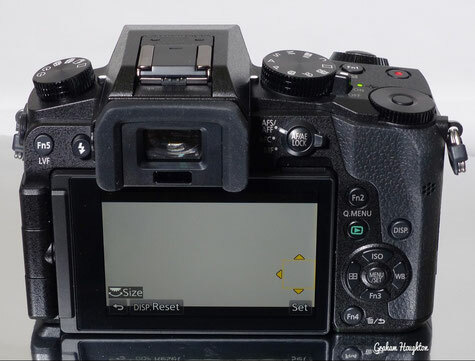 On the GX8 a button in the middle of the thumb dial performs this operation. You can customize what the dials do, but by default the button switches them from, say, exposure control to adjusting the white balance and ISO. In terms of customization it's not only these two dials that can be reconfigured. The GX8 has no fewer than 13 customisable function keys: five are soft keys which use the touch-screen, but eight are actual physical buttons. Unfortunately like the FZ1000/ G series, there's no dedicated dial for the drive mode. Rather these options are adjusted by pushing the down button on the rear pad. Meanwhile pushing up sets the ISO, pushing right sets the White Balance and pushing left sets the Direct AF area selection. In terms of connectivity, the GX8 is equipped with a combined USB / AV output, a Mini HDMI port and a 2.5mm jack that doubles as a mic input and for connecting old-style remote release cables. It's a shame that it is not a more standard 3.5mm microphone jack, but at least the GX8 now has microphone connectivity as this was absent on the GX7. In a nice upgrade, the USB port now supports tethering via a laptop, a feature that was previously only available on the GH4. As before the BLC12E battery and memory card are housed together in the grip, positioned just far enough away from the tripod thread so that smaller plates won't block access. Panasonic quotes a battery life of about 340 shots under CIPA conditions, however I found that I could only achieve far less than this when interspersed with a few minutes of video added into the equation. 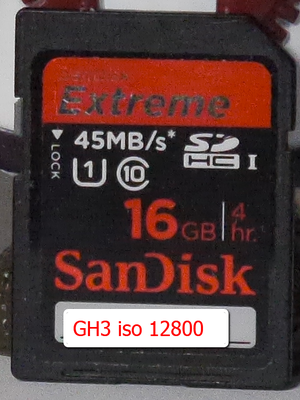 I ran out of battery after approximately 2 hours of shooting stills (218) and 8 minutes video. The Lumix GX8's main exposure dial offers the usual PASM modes, along with Creative Movie mode (which also unlocks all the video options), Panorama, three Custom positions, Creative (with a bewildering choice of 22 effects), and the usual Intelligent Auto. There's no Scene presets nor a dedicated position on the dial for 4K Photo mode. Instead both these positions on the dial are devoted to providing additional Custom presets C2 & C3. The GX8's mechanical shutter offers speeds between 1/8000 and 60 seconds, and additionally the maximum Bulb time has been extended from two minutes to 30 minutes. Compared to the Lumix G7 which offered a 60 second to 1/4000 range with a Bulb of two minutes. Switch the GX8 to its electronic shutter option and the fastest shutter speed accelerates to 1/16000, giving you an extra stop over the top mechanical shutter with the added benefit of operating in complete silence and avoiding any potential shutter shock. This extra stop makes it easier to shoot in bright sunlight at large apertures without having to deploy neutral density filters, and is ideal for freezing very fast action. Note the slowest shutter speed with the electronic shutter on the GX8 is one second, although the full 100-25600 ISO sensitivity range is available. One "Gotcha" is that the Flash is disabled if you leave the electronic shutter set to ON, it must be in the OFF or AUTO position for the flash to be enabled (via the hot shoe connection)! electronic shutter image skew on moving objects or performing camera panning operations. Electronic shutters do however have some limitations you should be aware of. Most notably their readout time can mean a moving subject could have shifted on the frame before all the data is gathered, resulting in undesirable skewing artefacts; this can also be seen if the camera is panning. 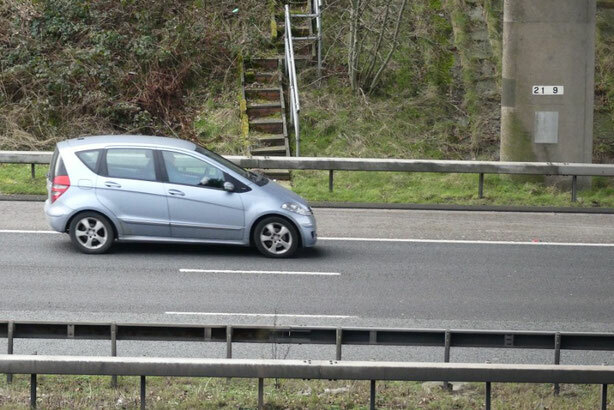 You can see the effect in the adjacent image where the car appears to be skewed from bottom to top. 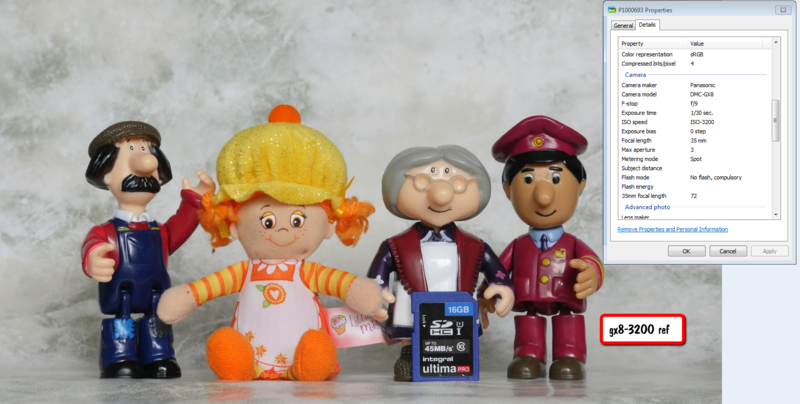 If you understand their limitations though, electronic shutters can still be very useful, not just for being discreet in quiet environments, but also for avoiding shutter shock and shooting with large aperture lenses in bright conditions. I also like to use them during timelapse sequences to avoid the constant sound of the mechanical shutter clicking away and reduce shutter wear. It's a key benefit over most DSLRs which currently don't offer truly silent shooting options. 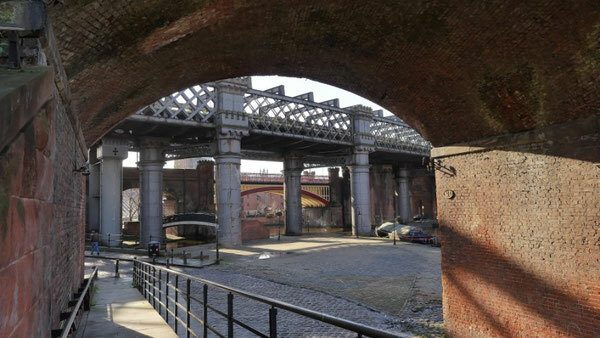 The Panorama option, found now on the mode control dial, gives you the usual choice of Standard or Wide image sizes and the chance to pan the camera up, down, left or right. The camera keeps shooting to generate a full 360 degree panorama, which can require some practice to keep turning, but you can of course crop the image to your desired coverage. The GX8 does a good job at blending the exposures, although you can spot multiple instances of subjects in motion, such as birds in flight or people walking by, so its best suited to instances where this doesn't matter otherwise some post image editing is needed to clone out these instances. 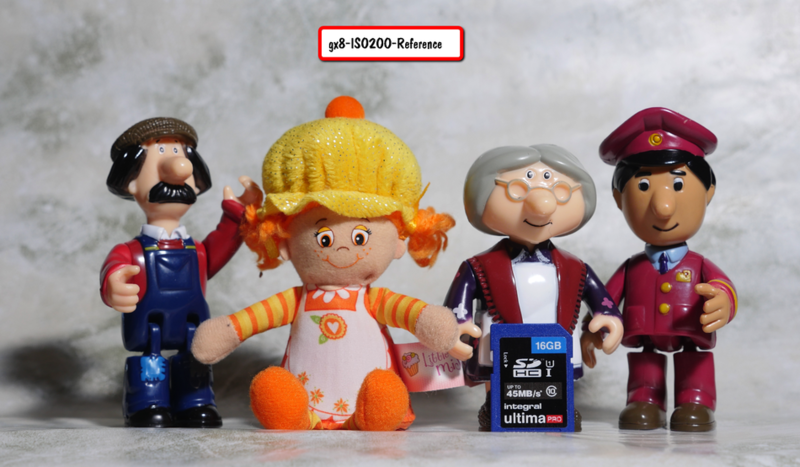 If you want additional dynamic range then there is the option if you shoot in JPEG mode only to create an in camera HDR composite image which captures three frames at 1, 2 or 3EV intervals before compositing them into a single file. If you prefer to generate HDR manually, or simply want to ensure that you have captured an important subject, the GX8 is very well-equipped for exposure bracketing with three, five or seven frame options at up to 1EV apart; these can be triggered singly or in a burst. Unfortunately these cannot be done with the internal camera timer as they're in the same menu. There's also plenty of control over the way the camera processes images, including the chance to adjust tone curves in the Highlight Shadow menu. 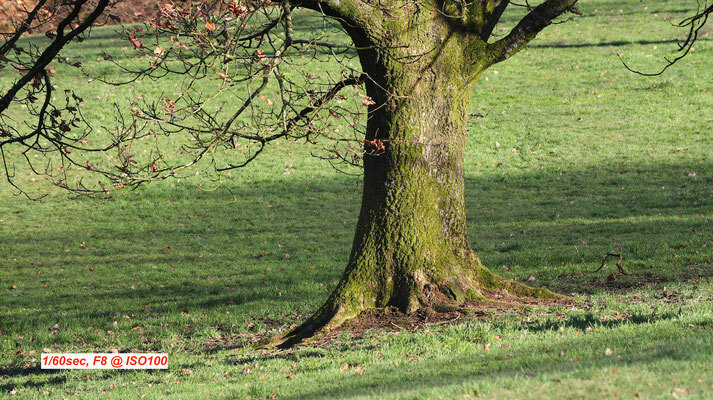 Adjacent is a subject containing a wide range of highlight and shadows captured using this method. The Lumix GX8 offers in-camera Timelapse capabilities with the opportunity to encode the frames into a movie afterwards, in 4K resolution if desired. You can adjust the shooting interval between one second and 99mins 59sec, and for between one and 9999 frames. You can also delay the start time up to 24 hours in advance. 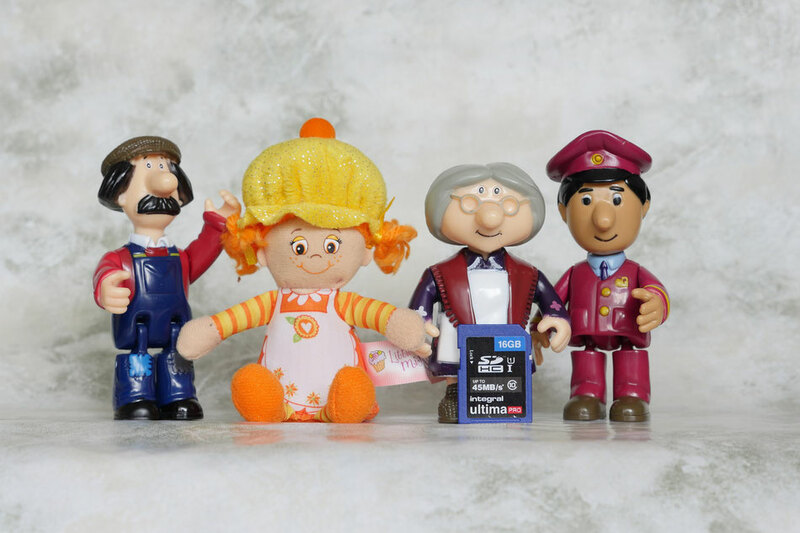 Alternatively you can choose the Stop Motion option which relies on you pressing the shutter for each frame when you're ready. Once you've captured the desired number of frames, the camera offers to encode them into a movie. If you prefer you can trigger this process during playback later. The video resolutions include VGA, 720p, 1080p (at up to 50p/60p) and even 4k (at 24 or 25 or 30p depending on region). You can also choose a lower frame rate to stretch your movie length and choose whether to run through the sequence forwards or backwards. It is also possible to re-run this process as often as you like to create multiple versions of the same video clip. When capturing the frames for a HD project, be careful to choose 16:9 aspect ratio before starting , otherwise you may end up with 4:3 shaped video letter-boxed in a 16:9 frame. I'd also recommend reducing the image quality to ensure you don't run out of space. The Medium resolution (8 Megapixels in 16:9) actually records at the 4k UHD frame size, so is perfect for generating 4k video and unless you intend to manipulate the frames later. 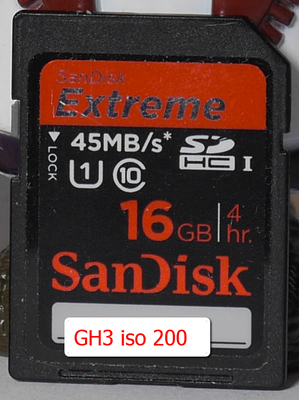 You could record in RAW however, the processing time would be extremely long to convert to the video format chosen. There's four continuous shooting modes on the Lumix GX8: Low (2fps with Live View), Medium (5.5fps with Live View), High (8fps without Live View) and Super High (40fps but only for a three second burst of 120 frames and at a reduced resolution of 10 Megapixels using the electronic shutter). With Continuous autofocus, the top speed reduces slightly to 6fps regardless of whether you're set to Medium or High, so you may as well go for the former and enjoy Live View. Panasonic quotes 'more than 30 frames' when RAW files are being recorded. In terms of bursts with continuous AF, I shot a variety of subjects in motion and found the GX8 recording between four and five frames per second, with generally all of them in focus! The GX8 offers a 4K Photo mode. 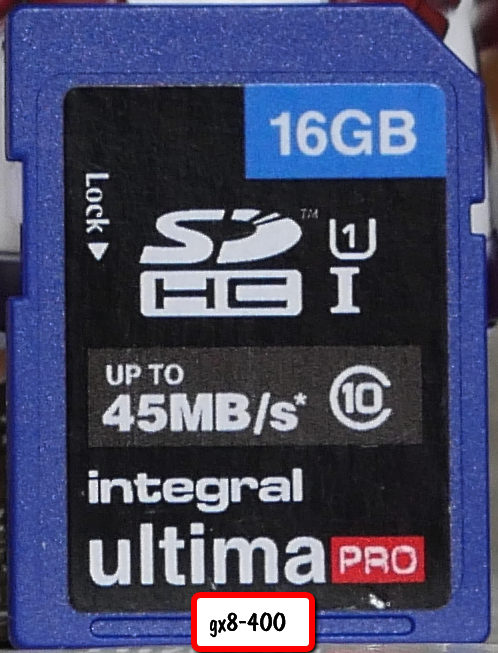 4K video actually contains 8 Megapixels of information on every frame, so why not use it for capturing reasonable quality stills at high frame rates? There's three options: Burst (which records video while the shutter button is pressed), Burst S / S (which starts recording with one press and stops with another), and 4K Pre-burst (which keeps a rolling 2 second buffer to avoid unwieldy clips to store and go through). The 4K Photo mode is great for capturing the perfect moment when faced with fast action, but it's also surprisingly useful for portraits, especially of children, where an expression can change between frames. The GX8 lets you choose from six AF area modes: pinpoint, single, Custom Multi (which lets you configure your own focus zones), 49-Area, Tracking or Face Detection. 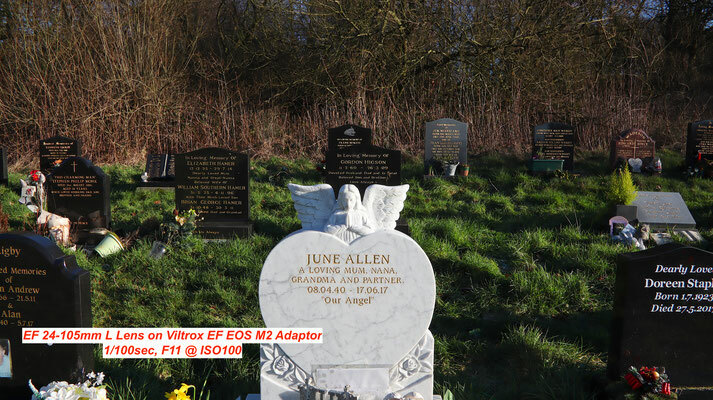 In each case you can use the touch-screen to reposition AF areas or select subjects. Panasonic even lets you tap the screen to configure the AF area when you're composing through the viewfinder. This can be achieved by swinging out the lcd panel and using a finger to rapidly adjust the focus point - a really useful feature. As always, the Single AF modes are the highlight of the Lumix GX8 focusing experience. The camera focuses quickly and confidently even if the AF area is dialed-down to its smallest size, and impressively in very low light too. The GX8's AF system works down to -4EV with a sufficiently bright lens which means it can simply keep focusing in very dim conditions when other cameras become sluggish or give up. It's an important capability that makes the GX8 very usable across a wide range of lighting conditions. Whether you're shooting cityscapes at night or exploiting the excellent face and eye detection to capture events, the GX8's AF system feels very confident. The Lumix GX8 offers 4k capture, full control over exposure, silent screen-based adjustments, flat video codec profiles, focus peaking and zebra patterns. 4k UHD video is available at 24p and either 25p or 30p depending on region, all at 100Mbit/s. 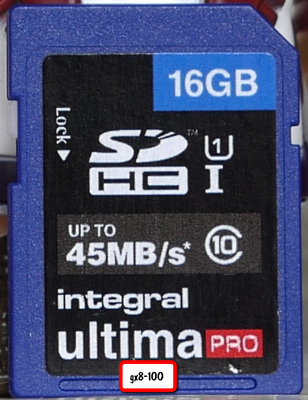 Alternatively you can capture 1080 at 50p/60p at 28Mbit/s, or at 25p/ 0p at 20Mbit/s. 720p and VGA options are also available. The maximum recording time on all models, independent of sales region, is 29:59. The in body stabilisation is not available for video. A new, in camera, electronic stabilisation mode is offered for 1080p, but not at all for 4k - so if you want stabilised 4k footage, you'll need to use an OIOS (optically stabilised lens). You can start recording in any exposure mode by simply pressing the red record button, but for the most control and options you should turn the mode dial to Creative Video which lets you film in the choice of PASM modes with full control over exposure. 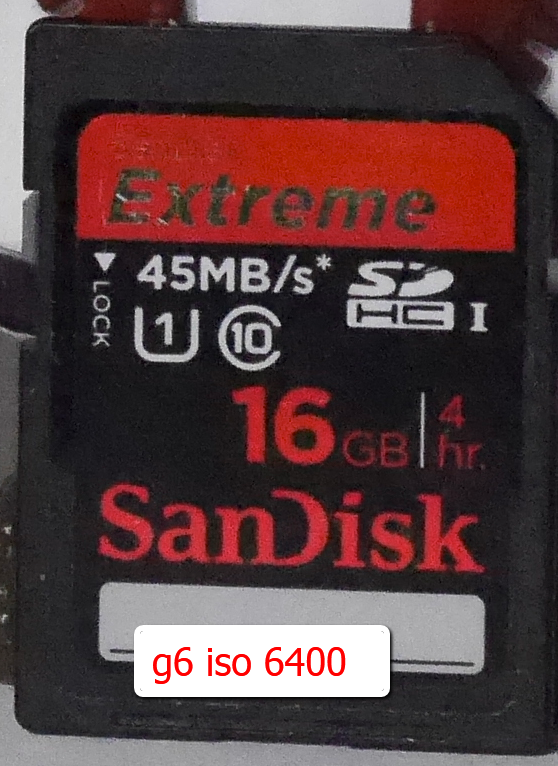 The sensitivity for movies is selectable between 200 and 6400 ISO, and there's an Auto ISO option too, although sadly not when shooting in full Manual mode. The touchscreen can be used for video: it's possible to touch to pull-focus between subjects when filming, either automatically if Continuous AF is enabled, or as soon as you half-press the shutter release if it's disabled. Tapping the screen also pops-out a tray of controls, allowing you to silently adjust the aperture, shutter speed, ISO, exposure compensation or microphone level all while filming, depending on the mode. A variety of processing parameters can be adjusted within the Photo Styles, including sharpness, contrast, saturation and noise reduction. There's also the Cinelike V and Cinelike D profiles the latter offering fairly flat output for grading later (plus you can dial-it down even further if desired). You can also choose between 0-255 and 16-255 for the Luminance Level, the former being preferrable if you intend to capture the best-looking stills from footage. Audio is recorded using either the built-in stereo mics, or an external microphone connected to the 2.5mm jack. Stereo level meters can be displayed and the level adjusted in fine increments, but there's no headphone jack. The Extra Teleconverter option works in all but the 4K modes, taking a 1:1 crop from the middle of the frame at the selected video resolution and therefore providing a tighter view without degradation in quality; neatly the 1:1 crop also better avoids moire effects. When filming in 1080p, the Extra Teleconverter effectively applies a 2.39x field reduction. 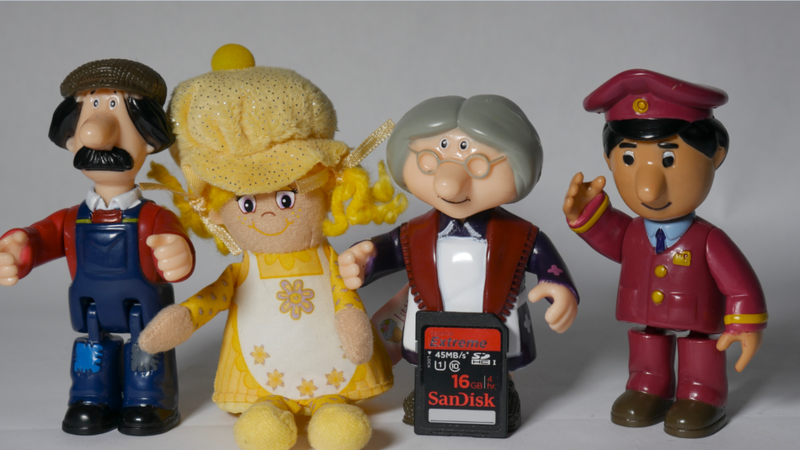 I have to say that the image quality is excellent from this camera partly due, I guess, to the new processing pipeline. 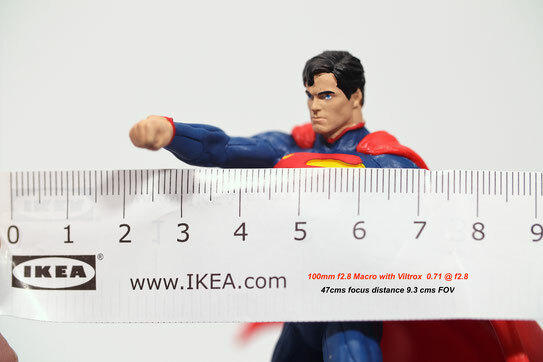 The additional leap from 16 - 20 megapixels sounds a lot however, in practice only gives a small amount of additional print area when you consider the 300dpi need for producing print. Nevertheless the increased resolution (when coupled with a lens capable of delivering that degree of resolution and fine micro contrast) does give some pretty good detailed images. The addition of the tilting EVF is a great feature for low level shorts as it allows those of us with less than perfect vision to really check focus etc. The new dials and access to certain functions is totally different to any other camera I have and did take some getting used to. Quick adjustments were often made impossible because I hadn't got into this cameras way of operation. If it is our only camera then once you have set up the Fn buttons to your preferences and got used to the layout of the dials and push buttons I'm sure it will become second nature and "on the fly adjustments" will be quickly achieved. 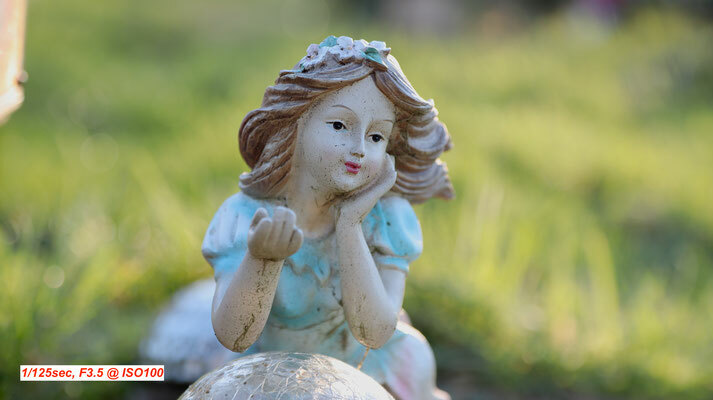 Autofocus is fast and accurate and the metering appears to be consistent also requiring very little in the way of exposure compensation except for those scenes which would normally require it, like backlight shots. For video it may not have all the features of the flagship GH4 but covers most of my amateur needs. I wish they had kept the 3.5mm audio input socket as it does mean using another 2.5mm to 3.5mm adaptor cable to utilise my external miss - and this could be a source of electrical noise. It's also welcome to see the Panasonic lenses with OIS are catered for, in the video mode with in lens stabilisation - using Olympus lenses would not give you the two axis stabilisation in video. Overall I would say it is a camera I could recommend if you want some really good image quality. With very usable ISO in low light up to about 1600 ISO it does give low light shooters, or lenses with smaller apertures, a great benefit. My main "niggle" is the fact the SDXC card is located in the battery compartment, not a deal breaker but when compared to the GH4 with side access it really is a bit of a pain when tripod shooting - even though you can still get access to the compartment with most tripod quick release plates.